Laminate floors come in a variety of colors and styles. With many decades of experience, Aleman Carpet has the professional technicians you need to find and install the perfect laminate flooring for your home. Using industry-leading materials, we are sure to give you a reliable new floor for your home. To learn more about our laminate and other flooring options, schedule a free estimate or stop by our showroom! We serve customers throughout Greater Middlesex County. Laminate has come a long way in quality and style. And you’ll be just as surprised by laminate that looks like tile or stone. As affordable as it is versatile, laminate flooring goes anywhere in your home. 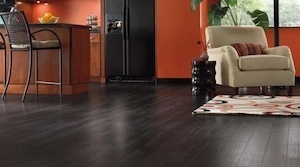 Installing laminate flooring will provide comfort and style for your home. Laminate is the perfect choice for those rooms in your home that get a lot of traffic, like entryways and family rooms. It’s also ideal in basements where concrete slabs lack the level surface needed for other materials like hardwood. 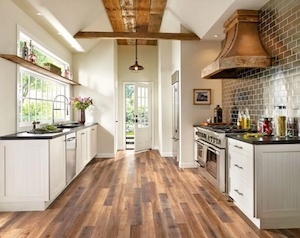 And you’ll love how easily laminate floors clean up in kitchens. Shaw Floors has been an industry leading in carpet, hardwood, and other flooring since 1946. Shaw always provides quality products that look great and stand the test of time. The first Mohawk carpet was created in 1878, and since then 100% of Mohawk's carpets have been assembled in the United States. Mohawk is proud to be a leading flooring manufacturer that ensures quality in each of its products. Mohawk's laminate flooring comes in hardwood and stone styles. Great for homeowners who don't want to compromise looks while on a budget, Mohawk ensures attractive, durable laminate flooring for your home. Founded in 1915, Mannington is dedicated to manufacturing high-quality, environmentally friendly flooring that suits all kinds of properties. Their innovative product design and state-of-the-art processes make them a leader among world flooring manufacturers. Laminate flooring by Mannington is designed to look just like hardwood or tile floors. Available in Restoration Collection, Revolutions Plank, Coordinations Collection, Value Lock Collection, all of their laminate flooring is affordable without compromising style. Are you ready to transform your home with a polished aesthetic? Laminate flooring is sure to do the trick! For laminate and other flooring products, Aleman Carpet is the company for the job. We offer free estimates throughout Perth Amboy, Woodbridge, Edison - schedule yours today!